Two graduate students at the Auburn University College of Veterinary Medicine have been named Outstanding Master’s Students at Auburn for 2015 by the Auburn University Graduate School and Graduate Student Council. 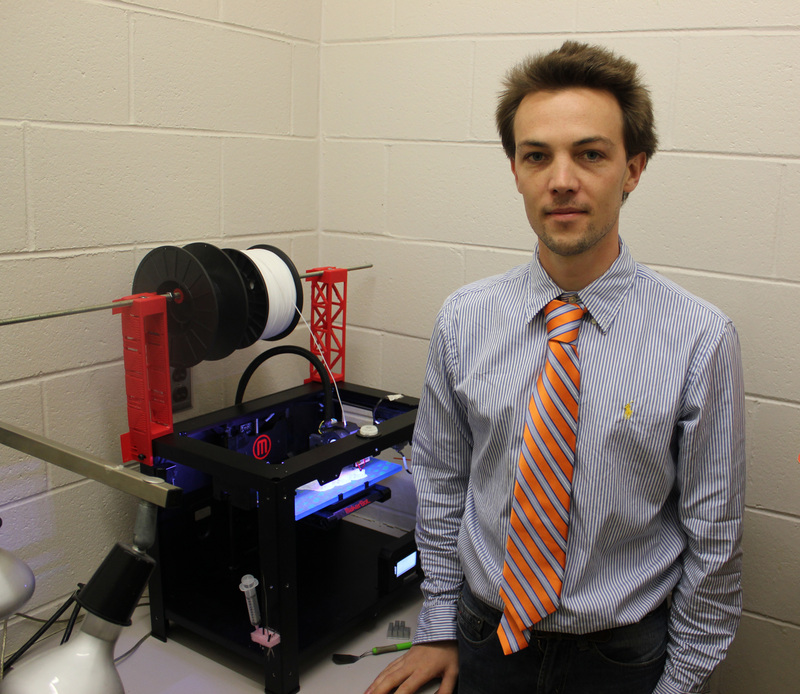 Dr. Adrien Hespel with the 3-D Printer. Dr. Adrien-Maxence Hespel, of Helesmes, France, is in the Radiology Section of the Department of Clinical Sciences and has been at the college since July 2012. 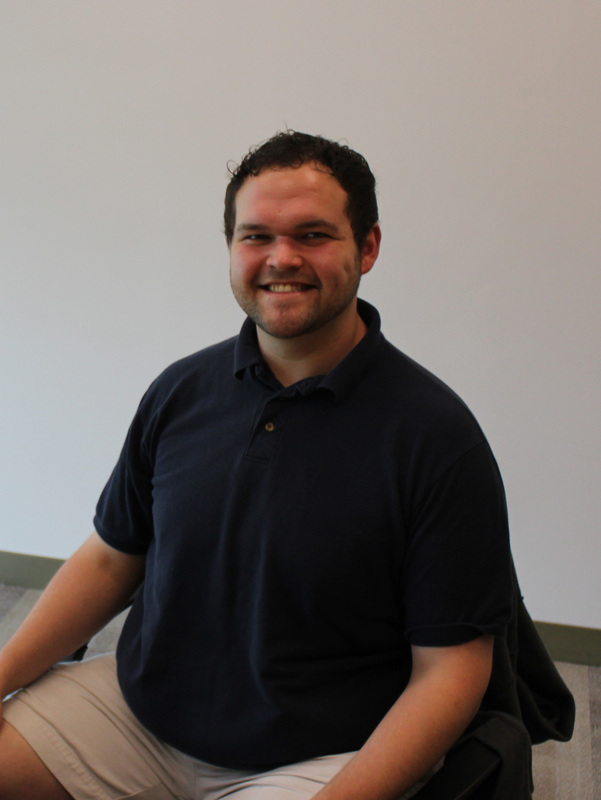 His research focuses on using 3-D printing technology to make life-size, to-scale replicas of bones and tissue from MRI and CT images to be referenced by veterinarians prior to and during treatment or surgery. This technology allows veterinarians to plan surgical operations to remove tumors, target specific region of the body, and shape metal pins and plates before surgery, saving time and reducing the risk of harm to the patient. Dr. Hespel is pursuing his Master’s in Veterinary Radiology, and hopes to become certified as a diplomate of the American College of Veterinary Radiology. J. Forrest Shirley, of Birmingham, is in the Department of Pathobiology, working in the Food Safety Laboratory. Shirley first came to the college as a student employee in 2009 while pursuing his bachelor’s degree, and it contributed to his life taking a major turn. “After graduating high school, I w anted to be a doctor like House from the TV show, but when I started to work in the lab, I found that I really loved microbiology,” Shirley said. Shirley’s research focuses on finding alternatives to using antibiotics to control bacteria in food animals. Specifically, Shirley is experimenting with bacteriophage to eliminate Salmonella in cattle. Shirley said that his research has been producing promising results thus far, and that in his opinion, bacteriophage therapy is an obvious solution to the growing problem of antibiotic resistance. “It’s a great honor to be recognized by the graduate committee, and I want to thank Drs. Price, Suh, and Wright for mentoring me and submitting my letters of recommendation,” Shirley said. Shirley is pursuing his Master’s in Veterinary Biomedical Sciences. Dr. Hespel and Shirley were two of 22 graduate student winners who were honored at the Graduate School’s annual awards ceremony in the Student Center Ballroom.